I grew up in Auburn/Grass Valley area. I was raised in a wonderful family that is very active and loves being outdoors, which is deeply ingrained in me. With that, sports and fitness has always been a big part of my life. I played volleyball in college and now I’m in my 10th year coaching volleyball. I currently coach at Whitney High School and for Synergy Force Volleyball club. When I’m not working or coaching, you will find me exploring and traveling to new places. My favorite place to go is Uganda. 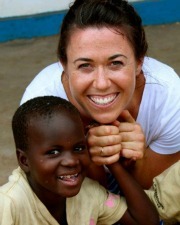 I am on staff with a non-profit that started a children’s center in a small village in Uganda. We now have over 1300 students and I have the joy of training them in sports education. I am currently studying to become x-ray technician. I am beyond excited to join the Hoffart Chiropractic team!